ARE YOU ORGANISING A CONFERENCE FOR WOMEN? Do you want to inspire them to change their mindset and behaviour in business, and to leave uplifted? DO YOU WANT YOUR AUDIENCE TO WALK AWAY WITH NEW INSIGHTS INTO WHAT’S POSSIBLE? THROUGH MY TALKS, I HELP PEOPLE GET CLARITY ON WHAT’S GETTING IN THEIR WAY SO THEY CAN ACHIEVE GREATER SUCCESS IN LIFE AND BUSINESS. “Ann truly speaks from the heart. “I invited Ann to be one of our featured guest experts for the virtual training programme with She Is Boss. Ann was fantastic at engaging with our members and providing such great content and value. 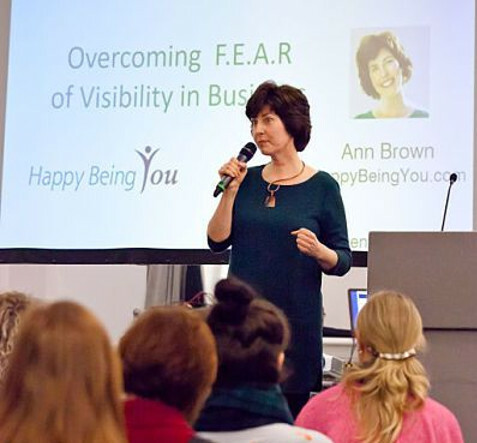 “Ann gave a speech on the fear of visibility at my event at the Damsels in Success Glasgow meeting. She was authentic and shared her own journey with the audience which they could all resonate with. Ann spoke naturally and with passion about her subject and gave practical tips for her audience which they could immediately implement. It’s clear that Ann knows her stuff and genuinely wants to bring valuable information for her audience that will help them on their journey of visibility.